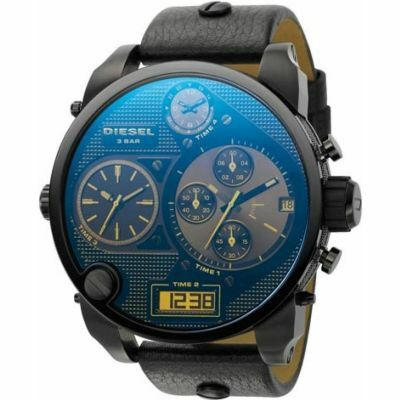 Intimidating mens Diesel Big Daddy model in black Ion-plated steel case with stealth black dial, featuring chronograph, date function from 4 independently adjustable analog and digital quartz movements. This eye-catching piece also features a chunky crown, buttons and fastens with a wide black leather strap. Awesome size at 57mm wide, and looks amazing in any situation, with diamond patterning on the side of the case to offset the polished bezel and case lugs and other detailing. Amazing piece of arm wear such a statement time piece. Perfect gift for 18th birthday a watch that will always remind the recepient of the special day. The watch is brilliant, it is exactly what it is made out to be. Its a large watch designed for showing off. Settings are perfect, i just love the stupidness of its size, attracts attention from everyone. Problem is that the dials arent luminous in the dark. So once its night time its completely impossible to tell the time. But who cares! This watch isnt designed for practicality. Would recommend to diesel to produce this with a black metal strap, because the leather ruins the mean look of the blackout watch. Good service from watchshop delivered on time and quickly. Once again would fully recommend! Excellent customer service, my boyfriend is very pleased with the watch. The service from Goldsmiths in Colchester was very hood. I wrote a review in March saying this watch was excellent and well built but I now change my opinion on that. 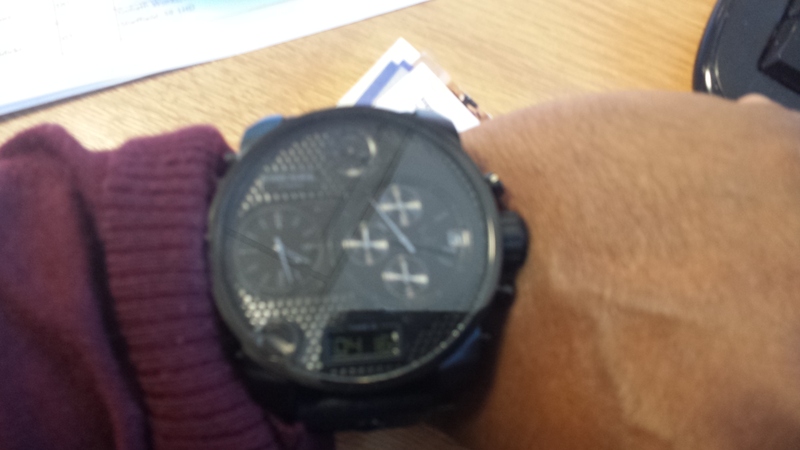 Ive had to get my watch replaced due to the watch face steaming up. Water some how got into the watch which was down to me being out in the rain while wearing it! My son loved his watch, I was a bit unsure because of the size but its looks great. Speedy delivery would recommend the site again. I bought the watch for my son who did some research into the Diesel watches and decided on this one. I thought/think it is too big but he is very happy with it. The only problem is that, as the face and dials are all black, it is not easy to read the time. As I said, my son is very pleased with it, and that is all that matters. This product is very smart and perfect for a present. Everything about this product is perfect black, smart, big face, easy adjust leather strap. Product really good. Only thing it is very difficult to see in the dark. Could do with a backlight button. It is a real eye catcher though. Considering the size it is really comfortable to wear. Great watch, love it! If you like oversized watches this is the one to get! It feels unite heavy and value for money and is comfortable... If you have it on a bit too tight it does dig in the sides of my wrist but I just made it a bit looser and was fine! This watch is amazing is so stylish and big but very light at the same time my husband was thrilled with this for his birthday. Plus delivery was the next day!!! Super convenient !!! Great purchase!! It is amazing to look at and extremely fashionable. Excellent, this watch with three different times which means that u can set times in three timezones. But actually, it is 57mm case width, so not very recommended for people with small wrist. Out of the four reviews no one has mentioned that this watch doesnt offer you any luminescent hands a long with no light for the digital dial which makes it extremely difficult to see in the night. why have they not added these fuctions to the watch it would have been even cooler. but if you ask me its a bad design. This is by far the best watch i have ever owned. The large, black face really looks cool and modern. The pattern on the sides really makes it feel industrail. the 4 clocks on the watch are really good to use, and are easy to set and change. Amazing watch. Big. Black.Fashionable. If you want to be envious looks of others, it's your watch. Reccomended for everyone. Better for bigger hand. Even though the watch is 5.5cm in diameter, its one of the best watch I have ever seen, everybody around me even at my place of work loves it. Its worth more than the price. I usually do not like large watches, and rarely buy brands like Diesel or Fossil but as I am giving my everyday wearer Fossil to my nephew I need to replace it with a rugged everyday watch. I do a lot of travelling so the quad time zone functionality appealed to me. Looks good with formal clothing, sometimes a bit bulky under the sleeve of a jacket, but just right for lounging about the house, travelling or just popping out with mates. All my other watches tend to be luxury brands, either swiss automatic chronographs or precision Japanese movement. Obviously does not compare but for where and when I need something that will see a lot of abuse it fits the bill.